The BBC’s weekly The Boss series profiles a different business leader from around the world. This week we speak to Kristo Kaarmann, co-founder and chief executive of money transfer business TransferWise. When Kristo Kaarmann was kicking himself for being “incredibly stupid”, little did he know that it would spark an idea for a business that is now estimated to be worth more than £1.2bn. Back in 2008, the then 28-year-old Estonian was working in London as a management consultant when he got a very chunky Christmas bonus of £10,000. As interest rates were higher back in Estonia, he decided that he’d transfer the money from his UK current account to his Estonian savings account, so as to earn more from the cash. “So I paid my UK bank a £15 fee, and transferred the £10,000, and then a week later I saw that £500 less than I had expected had arrived in the Estonian account,” says Kristo, now 38. “I started digging to find out what had happened, and I realised that I had been incredibly stupid. “I had foolishly expected that my UK bank would have given me the exchange rate I saw when I looked on [news wires] Reuters and Bloomberg. Annoyed with himself, Kristo vowed to come up with a way of transferring money overseas that removed banks from the process. Initially this just involved him and his Estonian friend Taavet Hinrikus, a then director at telecommunications firm Skype, informally transferring money between themselves. It worked because Kristo often wanted to swap pound sterling for Estonian currency, and vice versa for Taavet. They simply picked whatever was the mid-market exchange rate – the average exchange rate on any given day. Soon they had built up a network of Estonian friends – both expats and those back in Estonia – who were all doing the same thing, and Kristo and Taavet realised they could make a business of it. So in 2011 they launched London-based TransferWise, a financial technology or “fintech” website that allows users to transfer money overseas to a different currency at the mid-market rate for a set fee of 0.5%. Today, TransferWise is a global business, and investors include the UK’s Sir Richard Branson and PayPal co-founder Max Levchin. For the first year, Kristo and Taavet grew the business organically, relying upon their savings. Customers first arrived in a trickle thanks to word-of-mouth, but then rose sharply after a positive review on a technology website. To avoid any legal problems, Kristo and Taavet had secured clearance and licences from the UK’s then regulatory body, the Financial Services Authority, before they launched. In early 2012 Kristo and Taavet started to look for its first investors, but none were immediately forthcoming. “We talked to maybe 15 investors in total, but they all turned us down,” says Kristo. “No one in Europe would touch us – European investors back then were far more risk adverse than American ones. As TransferWise then steadily grew, other investors followed. It has now raised £305m in total. Meanwhile, its website and app have been used by more than four million people, and are available in 50 countries and 49 currencies. The company says that £3bn is now transferred via its service every month. With a second big office in Estonian capital, Tallinn, and eight others in locations such as Tampa Bay, Budapest and Tokyo, TransferWise saw its revenues rise 75% to £117m in the year to the end of March 2018. Its annual profit remained flat at £6.2m. Prior to March 2017, the company had always reported a loss, as funds were put into its expansion. It now has 1,400 employees. 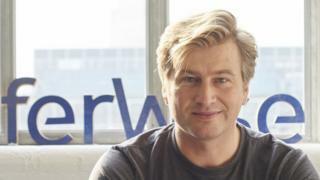 Fintech author and commentator Chris Skinner says that TransferWise grew so quickly because it was cheap for people to use, and there were no hidden fees. “Add to this some major heavyweights investing in and backing the business, and you have a potential success on your hands,” he says. “I say potential though, as even with a good idea, good marketing, good investors and good backing, nothing is guaranteed in this world. While Kristo has the chief executive title, he says that he and co-founder Taavet, 37, have “from the beginning both been involved in everything. We are very overlapping in what we do”. When not working, Kristo likes to relax by kite surfing, and every Christmas and New Year he goes long-distance cycling in Africa with his brother. “There were lots of unknowns when we started,” says Kristo. “Would anyone trust this website set up by two Estonian dudes? Would anyone else have this problem that we wanted to solve?